An essential part of The Wine Education is buying and drinking simple and accessible wines. We’re not seeking out rare, obscure, cultish, or limited bottles. Although I must admit my own cellar houses some of these expensive treats and I don’t need to be asked twice about whether to open them. Why buy it if you’re not going to drink it? This aside, we both agreed that, in the beginning at least, our tastings would encompass basic grape varietals and their blends from fairly well-known makers and vineyards. After all, the first goal for Him is to be able to identify wines by taste and smell (well, this and all the geographic memorization n that is going mostly well, as evidenced by previous posts). It’s a basic first step, so we’re starting with basic wines. We’re still loyal patrons to the several excellent nearby wine shops (such as Silverlake Wine, City Sip, Rosso Wine Shop, Palate, 55 Degree Wine, K&L, and Venokado), but the convenience of Big Mac’s is hard to pass up. 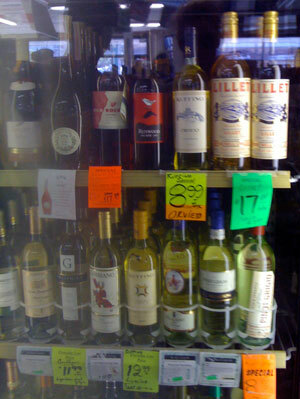 There is also something, well, democratic about buying wine at a corner liquor store. We’re not snobbish. He’s learning, I’m teaching and re-learning; we don’t have to be too fancy about it. Wanting to incorporate our favorite corner store into this site, we’ve decided that each Monday we will review a wine purchased from Big Mac’s (Big Mac’s Mondays? ), starting with one of three basics that kept us cool during the hot summer months: Orvieto by Ruffino, Bordeaux blanc by Mouton Cadet, and Pinot Grigio by Tamas Estates.